Now this review is a sure classic gadget. And one from 10 years ago! Now before anyone asks, is this fantasy or fiction I will state this is fiction and following my use of the keyboard it is no gimmick. In fact before I continue, I have been left stunned at how well its works. Not to mention the “wow” factor. All my colleagues, friends in the pub, new friends I have made showing the Virtual Keyboard cannot believe what they are seeing. However, they are equally amused by the fact it work. So what do you get in the box. 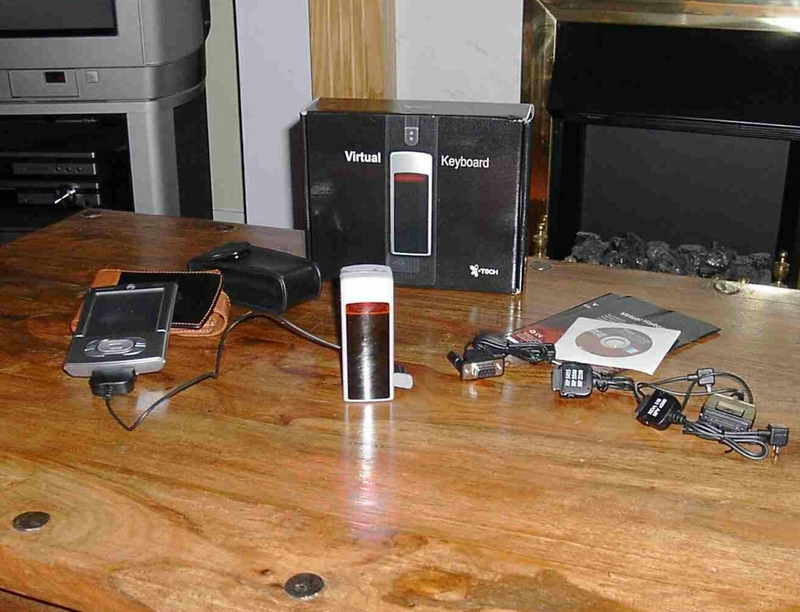 The Virtual Keyboard, a lovely small case for it, some instructions, the installation CD, and a whole host of adapters which connect to Palm, Pocket PC, Smartphones and even a PC (serial). 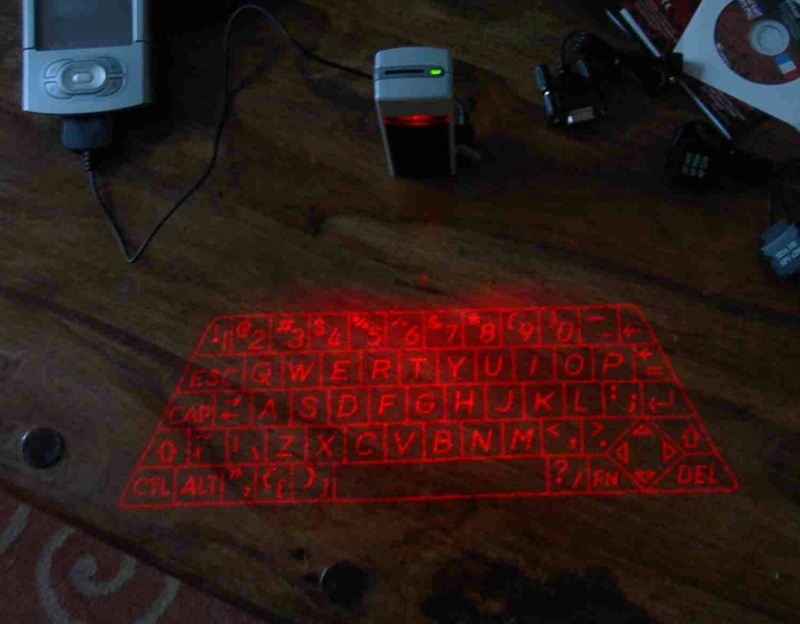 The Virtual Keyboard uses the latest infrared and laser technology to project a full size qwerty keyboard onto any flat surface. The actual device is quite compact. In fact it was a lot smaller than I had anticipated. Loading the installation CD revealed all the different operating systems. I chose Palm OS5 and installed the driver. Plug the charging into the wall and give the unit a 2 hours charge. This should last for 2 hours continuous typing. So in reality you should get a whole days worth of typing if you do a bit here and there. Next it is important to configure the driver to your own typing style and the various options as shown below. The size of projection is reasonable and easy to use. 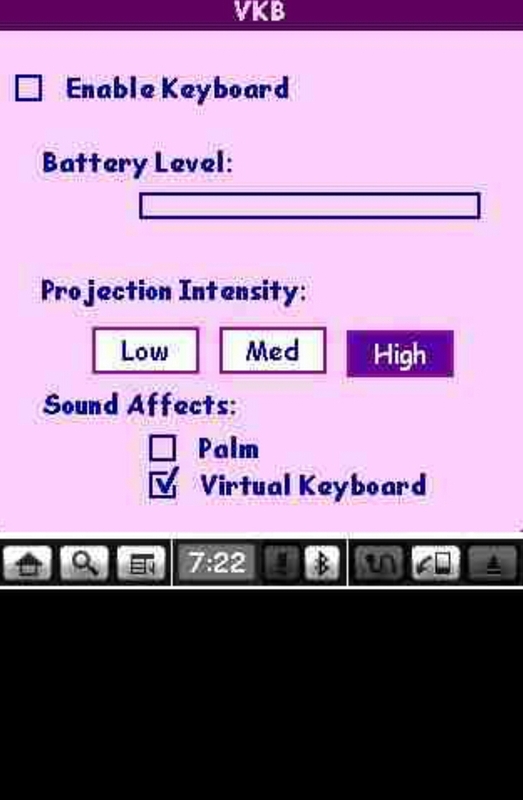 It is worth noting that the Virtual Keyboard cannot be used in direct sunlight and must be used on a flat surface. Also, the keyboard driver settings appear to be lost following a soft reset. So where in the world can you purchase this? I bought mine from Simple Solutions (http://www.simplesolutions-uk.com/shop/ ). This is the first time I used this company and I was very impressed at how efficient and helpful everyone was in answering all my questions. Also, my Virtual Keyboard arrived the very next day! Definitely recommended and a very cool piece of kit.